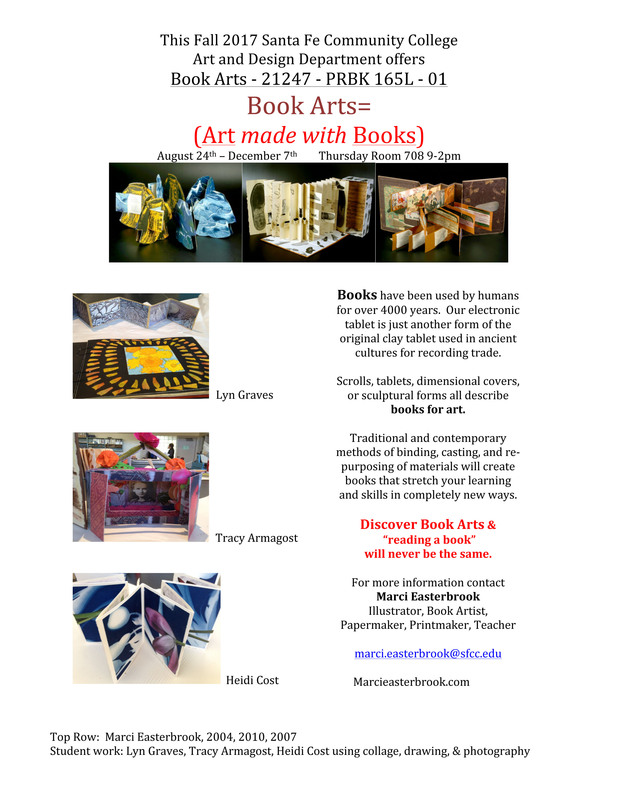 Book Arts I Starts August 24; Register Now! Book Arts (PRBK 165L, 21247, 01), August 24-December 7, 2017 (Thursdays), Room 708, 9 am to 2 pm, Santa Fe Community College Art and Design Department. Books have been used by humans for more than 4,000 years. Our electronic tablet is just another form of the original clay tablet used in ancient cultures for recording trade. Scrolls, tablets, dimensional covers, or sculptural forms all describe books for art. In this class with Marci Easterbrook you’ll use traditional and contemporary methods of binding, casting, and repurposing of materials to create books that stretch your learning and skills in completely new ways. Discover Book Arts and “reading a book” will never be the same. For more information contact Marci Easterbrook (Illustrator, Book Artist, Papermaker, Printmaker, Teacher) at marci.easterbrook@sfcc.edu or marcieasterbrook.com.